Jim Rome is one of America’s prolific sports broadcasters whose syndicated radio show is widely aired on over 200 radio stations across the United States and Canada. Jim Rome definitely knows his craft and this has earned him top ratings in the United States. His show made it to No 21 Most Listened To radio show and he ranked No 29th on Talkers Magazine most popular personality. As a broadcaster who knows his onions, he anchored a TV programme titled “Jim Rome is Burning” that aired weekdays on ESPN. His unique brash style of presentation has contributed to his success as a broadcaster. He currently works with CBS sports radio. 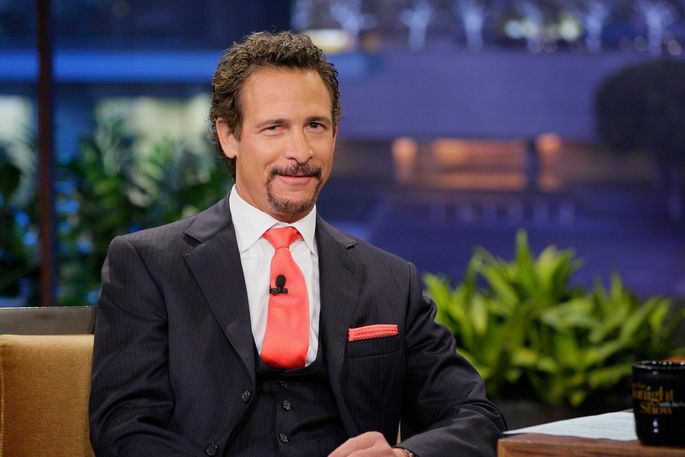 Jim Rome was born in Tarzana, California to father Jay Rome and mother Jan Rome on the 14th of Oct in 1964. Jim, whose full name is James Philip Rome attended Calabasas High school and graduated in 1982 before proceeding to the University of California, Santa Barbara where he graduated with a degree in Communications. While in school, he was said to be slack in studying as he preferred spending his time in the radio station studio. Jim kick-started his career in radio at his college-owned radio station KCSB-FM, he was the sports director at the radio station and also at KTMS in Santa Barbara. He started his radio programme “The Jungle” aka The Jim Rome Show at XTRA. The show was a success and had a huge following which led to its syndication in 1996. Throughout his career, Jim has been involved with few controversies, from the Jim Everett face-off to him offering $3,000 to challenge any team playing against the Vipers to kick the hockey legend Gordie Howe out of the pitch, when the legend announced his interest to play with the Detroit Vipers in 1997. He, however, apologized and called it a joke. Throughout his career, he has made several appearances in movies like Space Jam, Two for the Money and The Longest Yard in 2005, he has appeared on a sitcom Arliss and a music video. He also hosted Pat Tillman Memorial service on May 3, 2004. Jim Rome earns approximately $15 million as a sports broadcaster annually and his net worth is estimated at around $65 million. He is among the highest paid on-air personality due to his annual income and net worth. Aside from being a broadcaster and making appearances on films and music videos. Jim Rome is a horse racing magnate. His several interviews with hall of fame jockey Kent Desormeaux sparked his interest in horses and he ventured into horse racing, and soon Jungle Racing, LLC Stables was birthed. Jim and his wife have a particular interest in purchasing thoroughbreds and their list of horses have won important races. One of his horses named Misdirection won 11 out of 17 races before retirement. The mare which was co-owned by Danny Gohs, Bill Strauss, Borris Beljak, and Kevin Nish was purchased for $50,000 in 2010 earned them $1,719,621 before they sold it for $2.7 million. Rome is said to have owned or co-owned 14 horses both in his stables and in partnerships. Jim Rome website (jimrome.com) is currently valued at $9,000. While working for XTRA radio station, he met Janet Nauman a co-worker who later became his wife on July 19th, 1997 in a private wedding attended by close friends and family. The couple has two sons named Logan and Jake together. The family now resides In Irvine, Calfornia. Jim Rome is 5 feet 9 inches (175 cm) tall and weighs around 65 kg (143 lb). His body build is on the slim side, one of his distinctive features is the Van Dyke beard he has been grooming for years. Information about his shoe size and body measurements is not available. 1. Jim Rome made his debut in film in 1996; the animated sports comedy film Space Jam also featured Michael Jordan who played the major character. 2. He is fond of addressing his audience as clones. 3. While in high school, he was an active tennis player and excelled in it. 4. Jim Rome was notorious for reporting fake accident stories to keep his news interesting while working as traffic update reporter at KTMS. 5. He came under fire as a TV host when he angered NFL quarterback Jim Everett a guest on his show who he repeatedly called Chris, after a female tennis player Chris Evert, mocking his manhood. Everett got angry and flipped the table and Jim to the ground, he, however, issued a public apology. 6. Jim was known in the past to make fun of horse racing which he called a bet rather than sport but he later took interest in it and his horses have won big racing tournaments.